I was repurposing an older Xeon workstation and needed SATA ports which this particular system lacked (see eBabble Weakly for more info). There is a distinct lack of SATA rev 1.0a (with spec extensions)controller cards available, i.e. 300 MB/s connection, native command queuing, etc. Everywhere I looked I found derivatives of a Silicon Image SATA rev 1.0 controller with four ports on a 32 bit 66 MHz PCI connection. This would give a maximum throughput of 266 MB per second, which is all this motherboard would support anyway. The nice thing is they were cheap (all around $40 CDN) and apparently plentiful. A little searching gave me one choice for a card with what I was looking for, the Promise SATA300 TX4. To be fair there may be other cards available, but I’m a long time Promise fan (although it’s around $80 CDN). This is strictly a controller card, nothing fancy. It has four SATA ports, individual and aggregate LED headers and an SMBus connector for Promise enclosures only. In the center is the Promise controller chip, PDC40718-GP. It’s a low profile card that comes with the standard PCI slot cover and a low profile version in the box, along with four SATA cables and a semi generic CD that covers four different Promise SATA controllers. Like it’s competitors it’s 32 bit 66 MHz PCI; PCI-X 133 would have been nice. Installation was dead easy; it’s a PCI card! I connected my drives and installed Windows Home Server beta 2. Loaded the drivers and then installed the Promise Disk Controller Management Utility. This gave a nice showing of drive information connected to the Promise SATA ports and provided exactly one option: enable or disable Native Command Queuing / Tagged Command Queuing. Check with your hard drive manufacturer to see if your drives support this feature; it intelligently arranges hard drive requests so they come off the spinning platters with as few drive head movements as possible, thus speeding up your drive reads. This really could have been added to the BIOS so you don’t have to fiddle with a one option utility, but I’m nitpicking here. I thought about benchmarking but couldn’t see the point of it: this card is for people who want to add SATA ports with NCQ to a computer. Yes performance is important, and my day to day usage revealed no performance or compatibility issues. 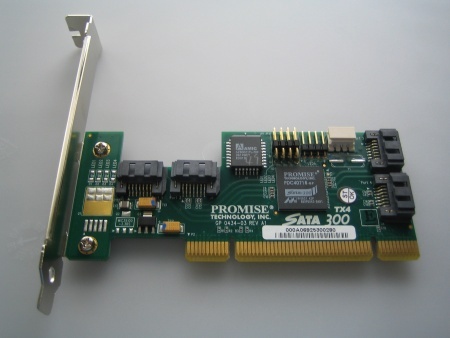 If you’re in the market for such a card, the Promise SATA300 TX4 is a solid choice.